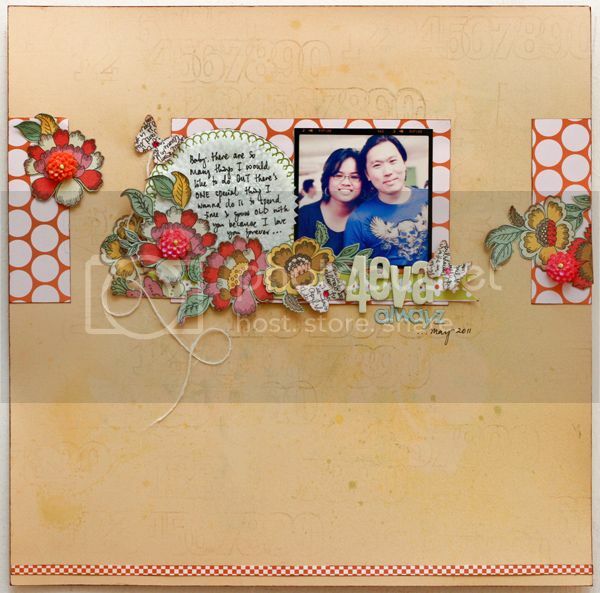 January - This layout is my fav of all favs because I love that man so much and of course the Studio Calico stamps too. This got to be pubbed in the Create: Stamping magazine. How cool eh? 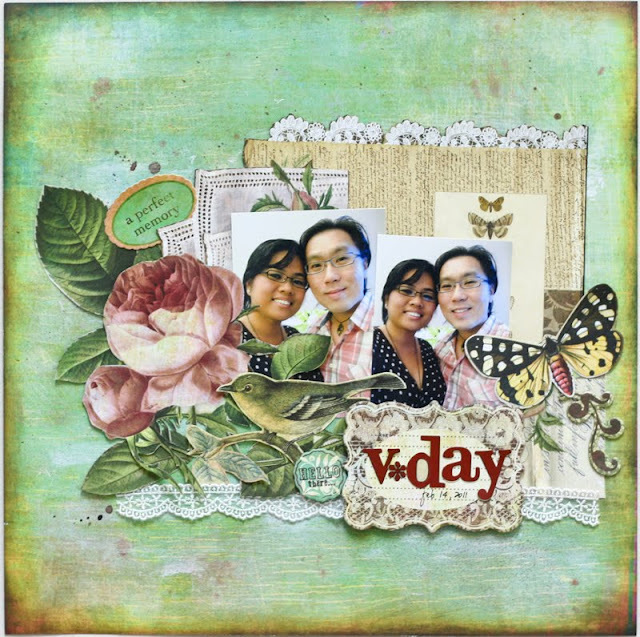 February - Basic Grey has always been one of my fav manufacturer and I created this layout after our V-day celebration. March - My first time scrapping this pretty girl called Telia. 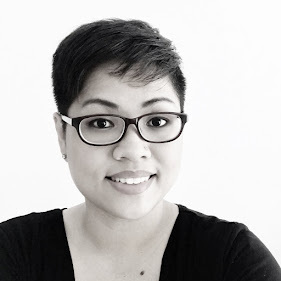 She's the daughter of the scrapping diva, Emeline Seet. 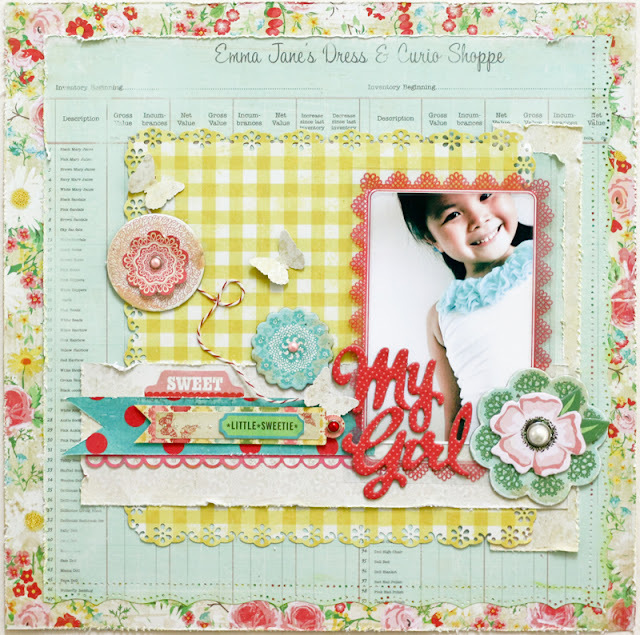 It's also my first layout for the Nook kit club. Also glad that it got picked for Create: Families magazine. April - I still remember that I was sick back then and created this. I really liked how it turned out tho I was feeling so lousy. Lol. June - That's my friend, Karen Hughes. She is one fun girl to be with. 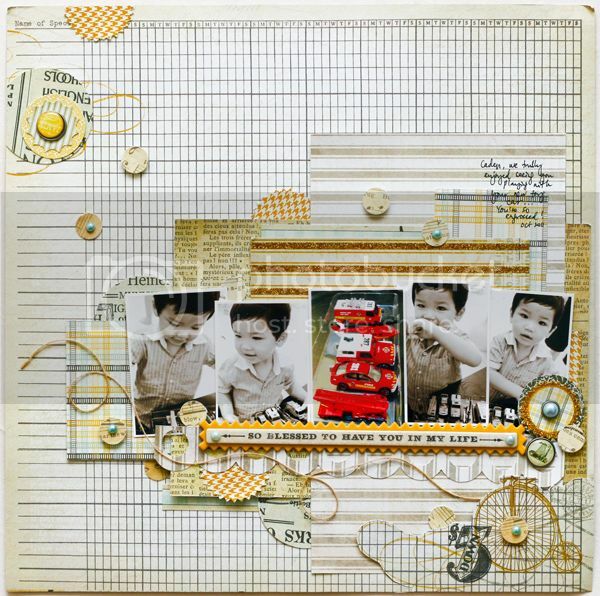 This is my fav mixed media layout because I went to town for the Smooch spritz. 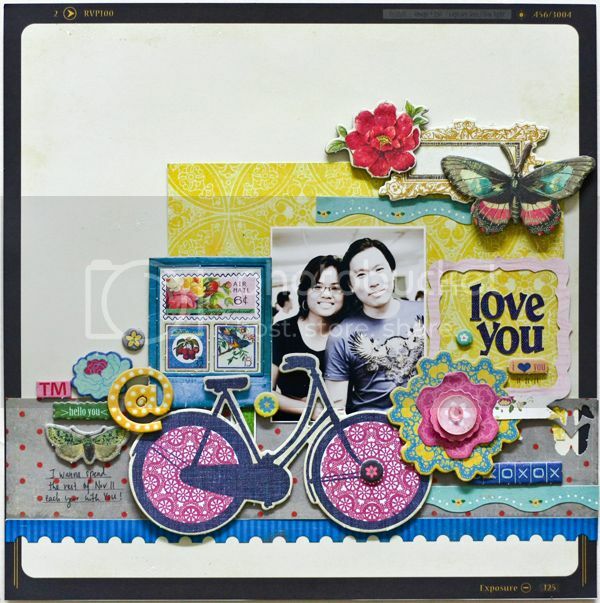 I had so much fun creating this whole piece colorful and not forgetting... fabulous! July - Receiving the Pink Paislee collection from YSS made me go crazy!! I totally love this line because it is so shabby n& romantic. This layout is pubbed in one of the Brazillian book and I am grateful for that. October - My nephew, Caden is one of the cutest boy I have ever seen. He was so engrossed with his cars that I have to capture the pics. Love all the different paper by My Mind's Eye on this layout. November - I was given the opportunity to guest for Freehand Scraps and I was given a beautiful kit, mostly filled with Fancy Pants. Cindy came to visit and had a short photo shoot session. I love these photos so much that I have to scrap them :) Another thing to smile about... this got chosen to be featured at 2peas header @ gallery home! So there you go on my 2011 fav layouts. I am glad to go through all my layouts and it definitely brought back alot of wonderful memories. 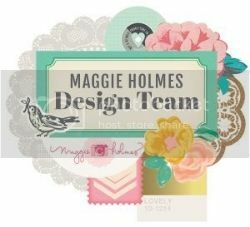 This year, I also got chosen to design for 3 manufacturers ie: Donna Salazar Designs, Doodlebug & Basic Grey. I am still pinching myself for that but am grateful for such opportunities. God is good! Thanks for dropping by and thank you for all your tremendous support and encouragements throughout the year. I pray that we will have a good 2012 together. HAH!! I started reading this post thinking I'd name a few of my faves of tyhe LOs you posted. It got ridiculous, because I TRULY love them all!! Thanks for sharing. SO inspiring! I'm happy you had a good year, my friend - you deserve it. I am hoping 2012 will be just as awesome, and then a little bit extra, just to make the cycle spin upwards. Happy NYE, my sweet friend! gorgeous syle...I love how you cluster! I just love all of these, but I think my favorite is the March one, it is so pretty! Happy New Year to you! I can't wait to see what you create in 2012! Lovely year in review!!! :) I recall many of these fantastic creations!! Here's to another wonderful new year!! Happy 2012! Pure eye candy, Jessy! Love your style with all the pretty details! Happy new year - can't wait to see where 2012 will bring you! They are all gorgeous, and so different too! Thanks for the inspiration. Love that you chose a fave for each month Jessy, great idea. You have such a romantic and soft style. My fave layout is the one of your nephew. I'm so happy I've met you through the Nook. Happy New Year my friend. Jessy, these are beyond amazing! You're such a talented scrapper, I LOVE how you have such detail and dimension to your pages! What a great 2011 you had! Lovely work from 2011, happy new year my friend and I am looking forward to more wonderful creation in 2012!!! Yes, 2011 was very good to you, and you deserve it all, Jessy! 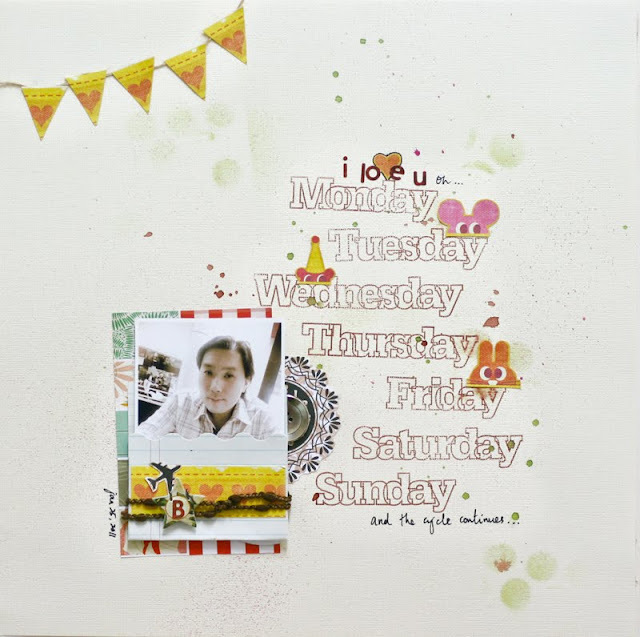 LOVE your beautiful layouts and LOVE your style! Looking forward to many more wonderful things from you in 2012. May it be your best year ever! Hi! I was on the DS blog & saw your name. I clicked on over to your blog & realized I know her from Instagram! Happy 2012! I love DS! I took her class at a local scrap store & fell in love w/her products! Happy New Year Jessie! Wow what a beautiful selection and I remember most of them too!! Must have been hard to narrow down those beauties to only 10!! I am sure this year will be equally fabulous for you & only pray that you do not fall sick this time!! Happy new year ! Such a fantastic body of work and so happy that your design career is shooting upwards in such an amazing way. I love seeing so many of your layouts in one post! You are SOOOO talented! Just amazing!!!!! Love them all! Wow!!! These are all eye candy to me! I enjoy looking each and everyone of your faves! 2012 will be a super great year for you, that's for sure! Hi Jessy!! Congratulations on your DT post, looks like 2012 will do you good!! Wonderful, wonderful!! :) I enjoyed looking at your favorite picks, those are gorgeous!! 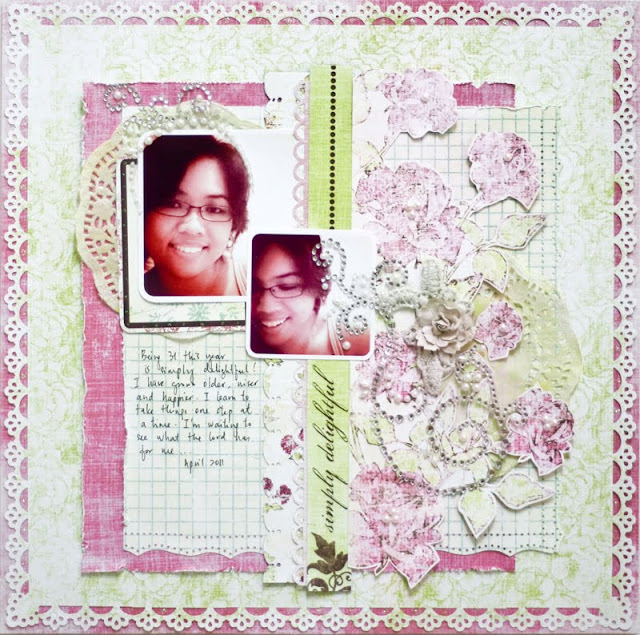 I love that shabby layout in pink!! All the best for 2012, lets keep in touch, ya!! xoxo.